Today I'd like to share a couple of Christmas cards created by my customers. The first one is from Christine. It is so clean and simple. I love that she printed out the image onto Kraft cardstock. The red of Santa really stands out. Dilyana created another beautiful card. This time she paired my reindeer image with a Tiddly Inks stamp to make a scene. Thank you for sharing your beautiful work with us, Christine and Dilyana! This month's release day (November 15th) is coming soon!! I'll show you sneak peeks a few hours later. ;) Until then! These areboth lovely...I love the simplicity of the first one! Ooooh thank you for showing my card Torico.... I'm really thrilled to be on your blog! You are a very talented lady and your artwork is fab... I look forward to using more of your designs! These are both so cute! 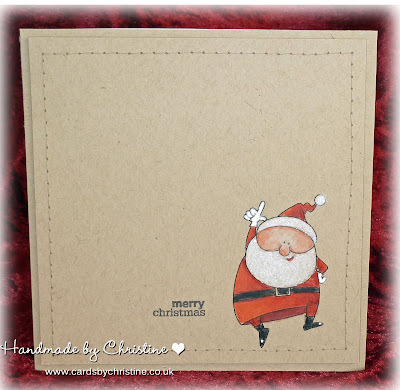 I just made two Christmas cards with the Happy Santa set. They don't have a lot of embellishments because I needed to leave space for signatures. Your images worked perfectly for these cards!